still operating in the Antarctic. 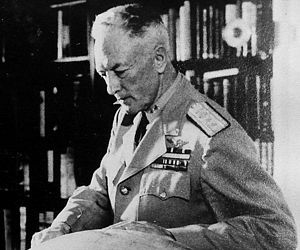 Admiral Byrd in an interview with Lee van Atta of International News Service aboard the expeditions command ship, the USS Mount Olympus, discussed the lessons learned from the operation. ‘Admiral Richard E. Byrd warned today that the United States should adopt measures of protection against the possibility of an invasion of the country by hostile planes coming from the polar regions. The admiral explained that he was not trying to scare anyone, but the cruel reality is that in case of a new war, the United States could be attacked by planes flying over one or both poles. This statement was made as part of a recapitulation of his own polar experience, in an exclusive interview with International News Service. Byrd said that the most important result of his observations and discoveries is the potential effect that they have in relation to the security of the United States.